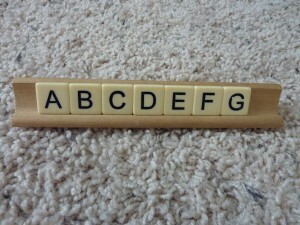 This will probably come as no surprise to any of you who read my posts, but item #2 that would definitely go in My Obstacle Course kit would be either Scrabble or Bananagram letters. I love them because they are so versatile. They can be used on their own or paired with a wide variety of things (sensory bin, flash cards, word clues) to help make building basic literacy skills fun. Their small size also makes them perfect for building fine motor skills. Like dice, they are easily stored in a plastic bag or container and require nothing more than you choosing how to use them as a station activity. 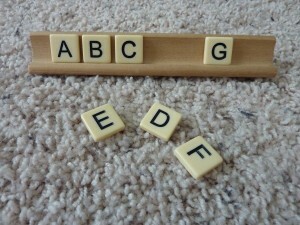 Note – If these letters are too small for your child and you worry about them putting them in their mouth, use something bigger like magnet letters. These can be found in most grocery stores, pharmacies as well as department stores like Target. 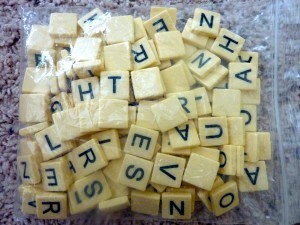 Click here for a link to the “Scrabble” search of my past posts to see some of the ways that I have used them with Andrew. Station set up for putting letters in the correct sequence. 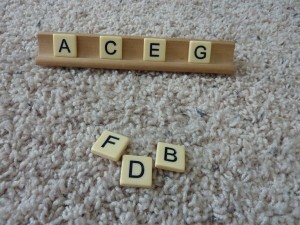 Letters A-G in the correct sequence. 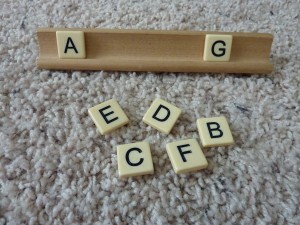 Another variation - putting out every other letter for the child to fill in the missing ones. If this is a skill that your child struggles with, provide them with a reference sheet. Remember that these activities are for reinforcement or building skills, so if they need something to refer to or check their work, provide that for them. This is as easy as writing this out on a sheet of paper or printing it off.